I definitely procrastinated when it came to writing about this particular experience with this particular picture because I’ll admit, it’s a little embarrassing. HOWEVER, I’m here to provide all of my readers with some entertainment, insight on some various foods and remain open for discussion! OK so this all started when I wanted to take something in to work around the holidays for my co workers. Instead of getting a bunch of individual gifts, I was trying to think of something fun I could bring in that everyone would enjoy. My mind first drifted to donuts (boring,) then cookies (so not original,) then TA DAH! It dawned on me this was the perfect opportunity to stop in this storefront that I had passed multiple times. Baked by Melissa! I think the reason I put it off for so long was because I know myself too well, and I knew that I would quickly become addicted. Baked by Melissa is a bakery with the right idea. Instead of walking into a bakery and not being able to decide which dessert to buy, the owner, Melissa Bushell, came up with the idea of having a huge selection of stuffed cupcakes, a tiny bit larger than a quarter, that everyone will enjoy. The best part is, you can try as many as you want and still not have too much of a guilt trip since they are so small. They have the classics such as red velvet and cookies ‘n’ cream, but the extraordinary flavors such as peanut butter fluff, smores and tie-dye are what really set this place apart from the rest. You cannot go in there and walk out with just one treat. Let’s just say that these were a hit at work. I was so pleased with the pricing as well that I knew I would definitely be back in the near future. Now, for the “embarrassing” portion of this entry. 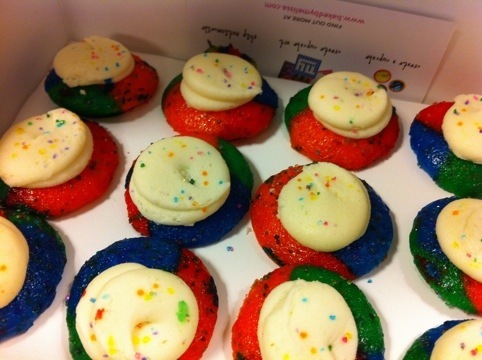 When I saw the tie dyed cupcakes, I immediately thought of my friend Amy. Hi Amy! When her birthday rolled around, I wanted to send her something in DC that was unique and obviously something she would enjoy. Well I had her card and I had one part of her gift, but the embarrassing thing is that my intentions were to try and mail her a dozen tie-dyed cupcakes. They come in nice packaging and I thought for sure it would be secure enough to send for a birthday surprise. As I was in line at the post office, I was trying to shake it around a little to “test” the box to make sure they would all stay in place for their journey to DC. I was starting to panic as I approached the front of the line because I was quickly realizing my plan was not going to work. The real pressure was that it was already past her birthday AND my hour lunch break was almost over. These little desserts were certainly not going to stay in their places in the box, let alone look anything like what they are supposed to look like once the box was opened on the receiving end. Go to Baked at Melissas before the end of the month to try the PEANUT BUTTER FLUFF cupcake: Brown Vanilla Cake, Marshmallow Fluff Stuffing and Peanut Butter Icing. DELISH! Hahahaha this just left the biggest smile on my face. I love you so much. Thanks for thinking of me. When I saw the picture before reading the end I was already transfixed by the magical looking cupcakes. Tie dye is such a cool idea! I love tie dye anything really but there is also a Giants logo in the box which makes it even better!! Hahah let’s make a deal: You bring me tie dye cupcakes, and I’ll have Georgetown Cupcakes (still haven’t found a better one down here) waiting for you. Something peanut buttery 🙂 I miss you and can’t wait to see you soon!!! !